Logically, it’s no surprise that 917 day and 918 day are followed by 919 day. And thanks to the amazing Spark 1/64 models they cutely dubbed “Sparky,” I have something to show! Next I would like to add the dirty version of the 2017 winner in 1:43, but until then this trio of 2015 cars will suffice. 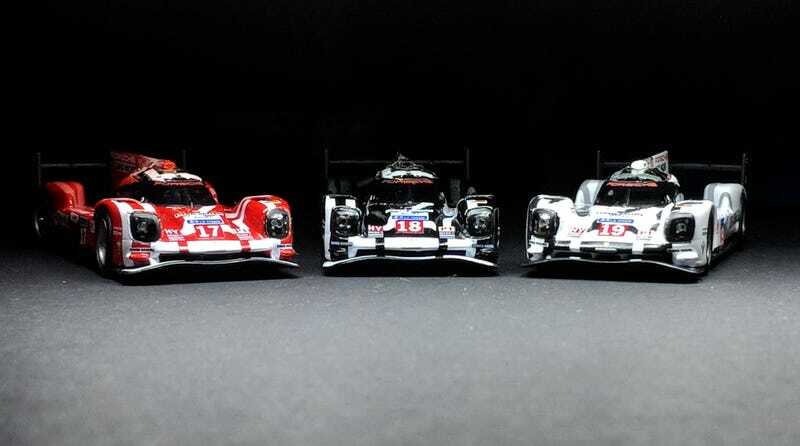 Arguably the best looking generation of the 919, these cars finished qualifying 1,2,3, and the race 1, 2, 5, with the “afterthought” third car, #19, winning the top spot with Earl Bamber, Nick Tandy, and Nico Hülkenberg at the helm. In photos the red #17 definitely turned out the best, but using some of Enginerrrrrrrrrrrrrrrrrrrrrrrrrrrrrrrrrrrrrrrrrrrrrrrrrrrrrrrrrrrrr’s lighting tips and my trusty Google Pixel 2 XL, I think they all turned out pretty badass. Happy 9/19 guys! And don’t forget the Porsche fun this month is NOT done, with Rennsport week coming up, as well as 9/28 and 9/30 standing out as potential model theme days!